I was delighted to receive this batch of wines from Andy Cook (right), ex-manager of Luvians bottleshop in the Scottish town of St Andrews, turned extremely successful winemaker in the Roussillon region. Andy now lives in Collioure with wife Kristen and family and holds down a position as winemaker at the renowned estate of Coume del Mas. 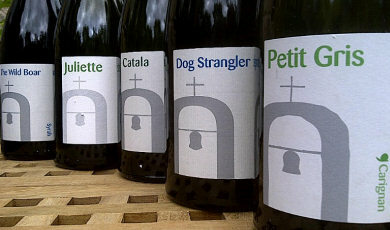 But since 2008 he has partnered with Philippe Gard, owner of Coume del Mas, in Tramontane Wines. Tramontane not only distributes the wines of Coume de Mas, but also those of Mas Cristine, a separate domaine with its own vineyards, owned by Andy and Philippe. A third range is labelled as Tramontane. These are essentially négociant wines, though Andy prefers to call them “partnership wines,” made by Andy or by friends in the region, but supervised “from vineyard to bottle” by Andy and Philippe. I have to say the wines were terrific overall, each a very modern take on classic styles of the region. Fruit concentration and intensity has been ramped up, but never at the expense of freshness and food-friendly, savoury character. This is the south of France, a few miles from the Spanish border, so ripeness and alcohol levels are high and the wines share a characteristic of power and weight, but balance is excellent by and large with fruit concentration, acidity and the always quite subtle oak influence all handled extremely well. The wines are available from Luvians Bottleshops in St Andrews and Coupar, Inverarity1-2-1 in Glasgow, Noel Young in Cambridge and Harrods in London. See all stockists on wine-searcher. See all stockists of Consolation wines on wine-searcher.